Iberico Sausage Fermín is a product that is made by hand from a selection of meat from Iberian pork, inlaid into natural pork gut. The combination of ingredients and a slow process of healing and maturation make this a high-quality, excellent taste and delightful aroma product. 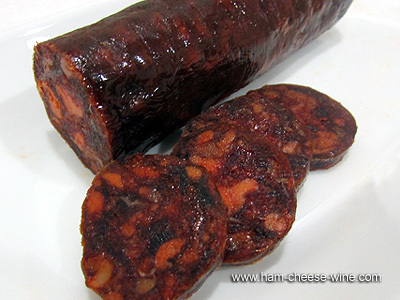 It is a raw-cured sausage that has very particular characteristics, from chopped and minced meat from Iberian pigs fed primarily acorns, and to which paprika and spices of the highest quality are added. Iberico Sausage Fermín is one of the most typical products of traditional slaughter, with a high nutritional value, due to being made with the best Iberian pork meat, seasoned with salt, oregano, garlic, paprika and the best spices, which also provides a delicate flavor and characteristic aroma. 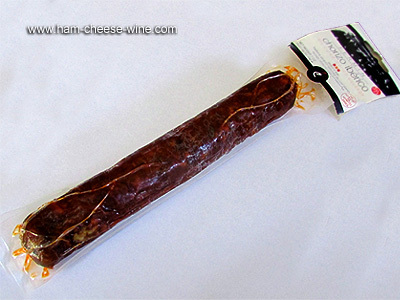 Iberico Sausage Fermín is cured in natural driers for at least 4 months, reaching a perfect balance of its ingredients. The sausages are hung to cure for several weeks in the cool mountain air in the village of La Alberca, following methods that have been passed down for centuries from master to master. 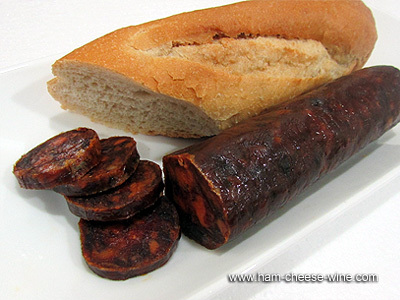 These Iberico Sausage Fermín are produced naturally without any preservative, additive or nitrates added. Ingredients: Lean Iberian pork, bacon, salt, paprika, oregano, dextrose, dextrin, antioxidant E-301, acidity corrector E-331(iii), sugar, preservatives E-252 and E-250. Natural pig gut. Store the Iberico Sausage Fermín at room temperature. If you like to have Iberico Sausage Fermín in the pantry for your home, you must observe certain precautions. 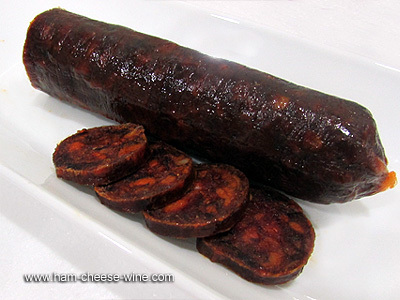 First, do not remove the skin to the whole piece of sausage, only what you will eat. Though this seems obvious, it happens sometimes due to ignorance. Store in a dark place, cool and dry place, a cupboard or pantry for example, as all cold cuts undergo transformations both in color and in flavor if exposed to light for a long time. Cover the cut with a plastic film and wrap with a cotton cloth. And very important, do not hang by the kitchen and keep it flat in the pantry or cupboard. Be advised that temperature changes will eventually deteriorate the taste, texture and even diluting the fat, if it's Iberian acorn sausage. once achieved a homogeneous mass it is inlaid in the gut and carried to the cellars for the curing process to be completed. This is done in refrigerated cellars, with automatically controlled both humidity and temperature and all the necessary parameters for this to be carried out normally. Balance is the key detail in Iberico Sausage Fermín. The mild combination of pepper and garlic, and the noble parts of the pig transmit softness and texture to the palate once this delicacy is tasted. Moreover, the perfect balance between all its flavors: brand new and complex, volatile and persistent, do make tasting this Spanish sausage a nuanced pleasure. 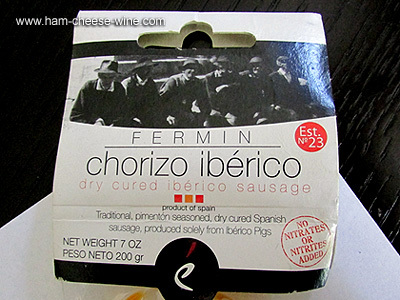 Hams and Sausages Fermín was the first producer of sausage and Iberian ham to be approved for export to the U.S. This family is based in the beautiful town of La Alberca high in the mountains near Salamanca. The cold and dry weather in winter and cool summer air are ideal for curing hams and sausages to the Spanish way of curing and aging. This Iberico Sausage Fermín, ready to cut and serve, needs no refrigeration and is a delicacy in sight, smells delightful and is a gift to the palate.